A-PDF OCR is a fast desktop utility program that lets you OCR scanned PDF paper books and documents into editable electronic text files fast and easily. A-PDF OCR has a build-in rich text editor which allows you to edit ocr result text without MS Office. 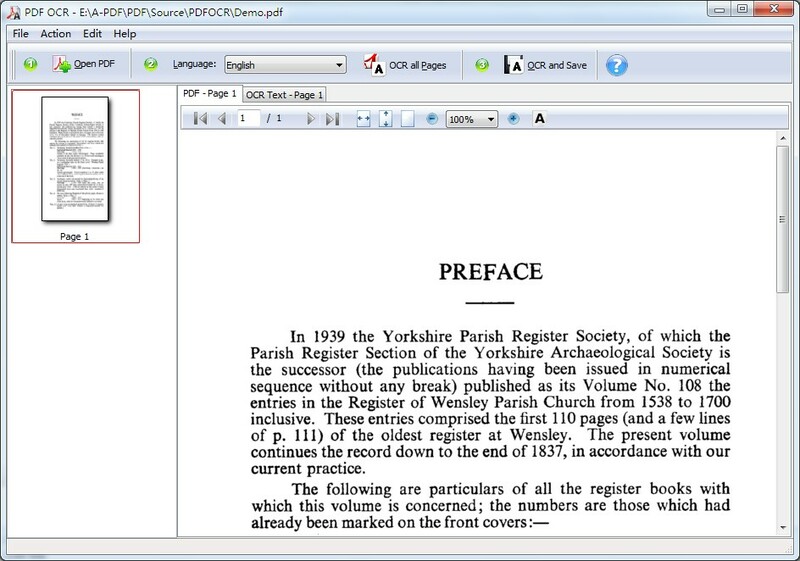 PDF OCR also supports OCR Page range of pdf file to text at a time.A-PDF's OCR has a fast OCR engine, 68% faster than other OCR software Over 10 Languages Supported. ...... character on the scanned document. The quality of OCR output is affected by matters such as poor image quality of the scanned document, mixture of fonts used in the scanned documents, and italicized and underlined fonts, which may blur the quality and shape of individual characters. A-PDF's OCR solutions focus only on the conversion of already created scanned PDF documents. A-PDF's OCR has a fast OCR engine, 68% faster than other OCR software Over 10 Languages Supported. Let you Edit Scanned PDF Documents like editing a text file! * Editable - Edit Scanned PDF Documents like editing a text file! * Easily - OCR PDF To Text Just In Only 1 Clicks. * Fast - PDF OCR has a fast OCR engine, 68% faster than other OCR software. * Page Selection - OCR single, range or all pages at a time.. Convert PDF to RTF, HTML and Text format with batch conversion, layout options. Convert your documents to Adobe PDF format quickly and easily. Add PDF is a user friendly and handy tool to Add and Split pdf Documents. Permits you to download patents from the United States Patent. ActiveX DLL to automatically create Adobe Acrobat PDF files. Convert image to PDF, preview images, - tif, jpg, bmp, gif, wmf, emf, png. Qweas is providing links to A-PDF OCR 3.6 as a courtesy, and makes no representations regarding A-PDF OCR or any other applications or any information related thereto. Any questions, complaints or claims regarding this application A-PDF OCR 3.6 must be directed to the appropriate software vendor. You may click the publisher link of A-PDF OCR on the top of this page to get more details about the vendor.